Barrow: Arnold, MacDonald (Waterston 80), Diagne, Diarra, Hall, Walters, Jones (Fitzpatrick 85), Gomis, White, Holt (Panayiotou 80), James; Subs not used: Dixon, Cook. Chester: Firth, Halls, Astles, Jones, Mahon (Brown 73), Gough, Anderson, Thomson, Crawford, Akintunde, Archer (White 90). Subs not used: Noble, Hellawell, Downes. 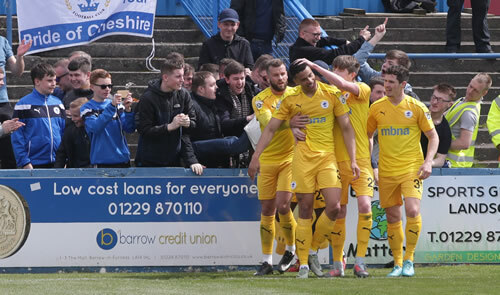 Chester finished their disappointing season with a victory at Barrow thanks to goals from Jordan Archer and Tom Crawford. Manager Calum McIntyre, in his last math in temporary charge, made two changes from last weeks side bringing back Myles Anderson and Archer to replace Cain Noble and Nathan Brown. Both Gary Roberts and Dominic Vose missed the match through injury. There was a scare for the Blues in the opening five minutes as James Jones almost headed into his own net as Barrow, looking for a win to secure the Conference status started strongly. Both Crawford and Jordan Gough saw efforts go wide from long distance before Chester opened the scoring on 20 minutes. A long punt downfield from Andy Firth was gathered by Archer who dribbled his way into the box before before shooting home from 12 yards to the delight of the away fans behind the goal. Chester continued to press after the goal as Andy Halls saw a shot deflected over and Crawford shot wide from long range with Craig Mahon better placed. 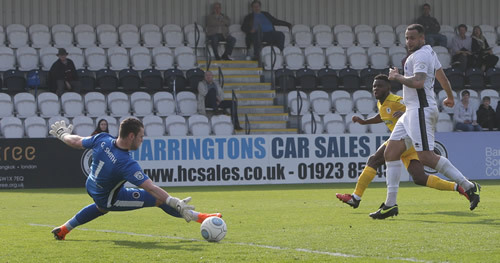 Ryan Astles saw a header hit James Akintunde with the loose ball being gathered in the home goal by by Steve Arnold. Barrow drew level as former Wrexham striker JOrdan White pounced on a mistake by Matthew Thomson to score in the bottom corner. Calum MacDonald almost grabbed an equaliser for the Bluebirds before Chester restored their lead on 76 minutes. Halls found Akintunde in the box with a through ball and he and Archer caused all sorts of problems before Crawford poked the loose ball home from ten yards. 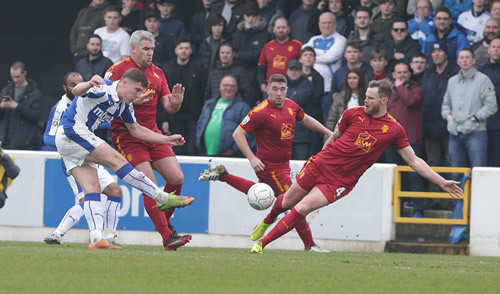 Chester saw out the remaining minutes to record victory while barrow survived the drop thanks to Dover’s victory at Woking that sent the Cards down. Chester: Firth, Thomson, Jones, Astles, Gough, Halls (Hellawell 78), Crawford, Noble, Mahon, Akintunde (Archer 72), Brown. Subs not used: Anderson, White, Cunningham. Maidstone United: Worgan, Hare, Finney, Wynter, Loza (Prestedge 46), Lewis, Anderson, Nana-Twumasi, Turgott, Coker (Wraight 59) Phillips (Reason 85). Subs not used: Paxman, Luer. The warm weather continued and Maidstone brought plenty of supporters – many of them dressed for the beach in Hawaiian shirts and one of them in a grass skirt. But their team could not afford to relax just yet – three points today would guarantee them safety and another season in the National League. Safety was now a forlorn hope for Chester of course. All that remained was to reach the end of the season and begin to plan for life in the National League North and under a new manager. Who, we wondered, was the candidate amongst the applicants for the job who had Champions League experience in the group stage? As Arsene Wenger had announced he would be leaving Arsenal at the end of the season after twenty-two years – he would certainly fit the bill. He might find the budget a bit tight though. Today’s temporary incumbent of the hot seat Calum McIntyre had to field more recruits from his excellent academy graduates today as Chester found themselves in something of an injury crisis. Especially so in midfield, Dawson and Roberts were both out through injury. Vose also was unavailable. Into the side came three debutants: Matthew Thomson at right back, Cain Noble and the hero of the Bromley game Nathan Brown, started for the first time. With the Stones desperate for the points and such a youthful City side home fans might have feared a humiliating experience but it was actually Chester who started the game much the brighter. Twice in as many minutes James Akintunde was put clear but shot tamely under pressure from a defender in the first instance and then his lobbed shot failed to find the target on the second occasion. Noble then finished superbly from Hall’s cross to sweep the ball past Worgan and into the net but the linesman’s raised flag spoiled the celebrations. Maidstone eventually began to apply some pressure and City had problems clearing the ball – especially from goal kicks. Firth seemed reluctant to kick the ball long but found nearby defenders closed down quickly by the Stones. Chester were guilty sometimes of trying to play their way out of trouble at the back and from one such instance Jones found himself penalised for bringing Loza down in the box. It looked a soft award but referee Dicicco adjudged it to be worthy of a penalty which Turgott duly converted. Buoyed with confidence Maidstone looked to increase the lead. Firth parried a corner and grabbed the rebound. Wynter, Maidstone’s skipper, was booked for following through too forcefully on the City keeper who needed medical attention as a result. Shortly after this Firth picked a poor pass to Halls who was already under pressure when the ball was passed to him. Phillips dispossessed him and took it round Firth to score the second. Chester were given a glimmer of hope before the break when Wynter scythed down Crawford in free flow and received a second yellow card. After half time the Blues built momentum as they sought to capitalise on their man advantage. The pressure culminated in an inviting cross from the right by Mahon which was met superbly by Noble who nodded it home and celebrated ecstatically. A brilliant debut goal for the seventeen year old and City were now back in the game. The wind was taken out of their sails, though, when Astles nutmegged an opponent who then appeared to obstruct him. The ref played on however and the Stones found Hare in space on the edge of the box and his shot found the net beyond Firth’s despairing dive. Blues rallied and went mightily close to adding to their tally but Maidstone held on to ensure their survival. The Stones went to celebrate with their noisy following in the corner whilst the young Blues received deserved applause from the remaining home faithful. There had been much to encourage City supporters despite the result. It would seem that the progress of the Chester Academy is at least one bright spot in what has been a hugely disappointing season. Boreham Wood: G.Smith, K.Smith, Woodards, Ricketts, Stephens, Shakes, Champion, Murtagh, Andrade (Davey 86), Folivi (Sach 72), Ferrier. Subs not used: Harfield, Quigley, Doe. Chester: Firth, Hobson, Anderson, Jones (Downes 87), Astles, Vose, Mahon, Roberts (Cunningham 78), Crawford, White (Brown 68), Akintunde. Subs not used: Archer, Gough. With manager Marcus Bignot sacked on Wednesday, Academy coach Calum McIntyre took charge of team affairs at promotion chasing Boreham Wood, at 24 becoming the youngest manager in the clubs history. Injury to Andy Halls meant a recall for James Jones in the Blues defence. It took Wood just seven minutes to open the scoring as Bruno Andrade’s volley fizzed past Andy Firth taking a slight deflection on the way. Moments later Firth produced a great save to deny Keiran Murtagh whose close range header looked a goal all the way. The traffic wasn’t all one way as James Akintunde slipped in Harry White but the Blues striker saw his effort pushed away for a corner by Grant Smith in the home goal. Just before the break right back Kane Smith was pushed in the box by Akintunde to concede a needless penalty, Andrade stepped up and gave Firth no chance from the spot-kick. Chester started the second period well with White seeing another long range effort pushed wide but on 60 minutes the home side wrapped the three points up by adding a third goal as Morgan Ferrier walked through the Blues back line to bury the ball past Firth. To their credit Chester continued to press and pulled a goal back on 74 minutes through Akintunde who finished smartly from a narrow angle following a pass from Crawford. As the game entered stoppage time Ricky Shakes added a fourth for Wood shooting home off the crossbar and in a frantic finish Akintunde added a second goal, similar to his first effort having been set-up by Karl Cunningham. Chester: Firth, Halls, Astles, Hobson, Anderson (Gough 57), Vose, Crawford, Mahon (Brown 79), Roberts, Akintunde, White (Archer 72). Subs not used: Dawson, Cunningham. Bromley: Gregory, Rees, Holland, Reymond, Hanlan, Dennis (Wanadio 54), Johnson, Sterling, Porter, Sutherland, Woolfenden. Subs not used: Dunne, Allen, Higgs. The Chester supporters in the meagre crowd of 754 for this re-arranged fixture went home with a smile on their faces thanks to a last minute winner by young substitute Nathan Brown. He picked up a reverse pass from Vose on the halfway line and began a dazzling run which took him past three or four defenders before firing a shot towards the goal. Gregory got a hand to it but could not prevent it hitting the back of the net – much to the jubilation of the long-suffering Blues fans. Twice previously a promising looking City had found themselves pegged back by Bromley who were still in with a chance of reaching the play-offs now that they extend to seventh spot for the first time this season. Chester took the lead initially in first half stoppage time with Vose driving home from the edge of the box. It was his first goal for City and against the team the released him earlier this season. After the interval Bromley upped their game as they realised that they needed to get something from the game. Anderson was injured for City and had to depart. Gough replaced him and found himself up against it at left back. Sutherland fired over the bar for the visitors but shortly afterwards Rees swept in the equaliser after Roberts was dispossessed in the penalty area. Chester responded well however. Crawford linked well with White and Akintunde but saw his effort turned round the post by keeper Gregory. And the Blues restored their advantage after good work by Mahon, Vose and Akintunde on the left led to substitute Jordan Archer tapping home the latter’s cross after he had slipped it past Gregory in the Bromley goal. It seemed that victory for City was to be denied once again as the Ravens own substitute Bugiel (He came on in the same minute as Archer) nodded a second equaliser from Sutherland’s free kick on the left. The disappointment of this second set back contributed to the euphoria that greeted Brown’s winner. Bignot had thrown him on for Mahon just after Chester’s second goal. His second inspired substitution of the night. A bashful Brown emerged later in the Blues Bar to high five his Dad on a proud night for their family. Those City supporters who were there to witness the game will surely see it as a badge of honour in years to come. Chester might be already relegated but this victory and that winning goal was far from meaningless to faithful fans. Chester: Firth, Halls, Astles, Hobson, Anderson, Mahon, Crawford, Roberts, Vose (Brown 80), Akintunde, White (Archer 65): Subs not used: Cunningham, Dawson, Gough. Tranmere Rovers: Davies, Buxton, Ridehalgh, Sutton, McNulty, Tollitt (Harris 83), Cook, Norwood (Mangan 73), Jennings, Norburn (Wallace 80), Hughes. Subs not used: Taylor, Monthe. Chester’s relegation to the Conference North was confirmed following this home defeat to Tranmere Rovers and Solihull’s late win at Hartlepool United. Defender James Jones was ruled out with an ankle injury so manager Marcus Bignot was forced to replace his with Dominic Rose while Andy Halls reverted to full-back. Tranmere, with more supporters in the ground that the Blues, had the first opportunity as James Norwood met a Connor Jennings cross to shoot against the bar from 12 yards. Good work from Vose set up Harry White but the striker couldn’t get on the end of the teasing cross. Ben Tollitt twice tested Andy Firth in the chester goal who produced two smart blocks to deny the Tanmere winger. Ryan Astles also produced a last ditch tackle to deny Jennings who looked certain to score from ten yards out. Ten minutes before the break Tranmere hit the woodwork again as Jeff Hughes met a corner but as the game entered stoppage time the visitors took the lead as Andy Cook met a far post corner and sent a looping header over Firth into the net. Ten minutes into the second period White shot high over the bar with Tom Crawford unmarked and in space to his right. Moments later Tranmere doubled their lead as Norwood raced through the Blues defence, who were appealing for offside, rounded Firth to slot the ball home into the empty net and complete a miserable afternoon for Chester. Judging by the performance of both sides at Moss Rose on this wintery Easter Monday, you'd never have believed that both sides looked destined to be playing their football two leagues apart in the 2018-19 season. It was never going to be a game of silky football, with the pitch looking close to either a mudbath or a sandpit in various patches, and an icy wind whistling down from the snow-topped hills. Following Chester's dismal bank holiday defeat at home against Torquay it seemed like a different side ran out in front of 262 travelling fans. In fact the only changes were Tom Crawford and Myles Anderson replacing Lucas Dawson and Lathaniel Rowe-Turner. But players like Craig Mahon and Harry White put on a better display than they had done for most of the season and ex-Macclesfield player Andy Halls was definitely playing like he had a point to prove. The constant boo-ing he got at each touch only seemed to inspire him! That said, Chester couldn't find the net, despite at least three good first half opportunities for White, as well as James Akintunde shooting over following a Gary Roberts' corner. Once Macclesfield went ahead on the 53rd minute, through a Danny Whitehead strike, you did feel the floodgates might open as usual. But Chester continued to fight back and were unlucky not to equalise when a White free kick hit the Macclesfield wall and fell well for James Jones. His shot was well saved by Silkmen goalkeeper Shwan Jalal. The drama wasn't over then as White had more chances and Chester thought they were in for a penalty when Crawford appeared to be fouled in the box. But referee Thomas Bramall ignored the appeals and Chester's chance of a rare away point slipped away.